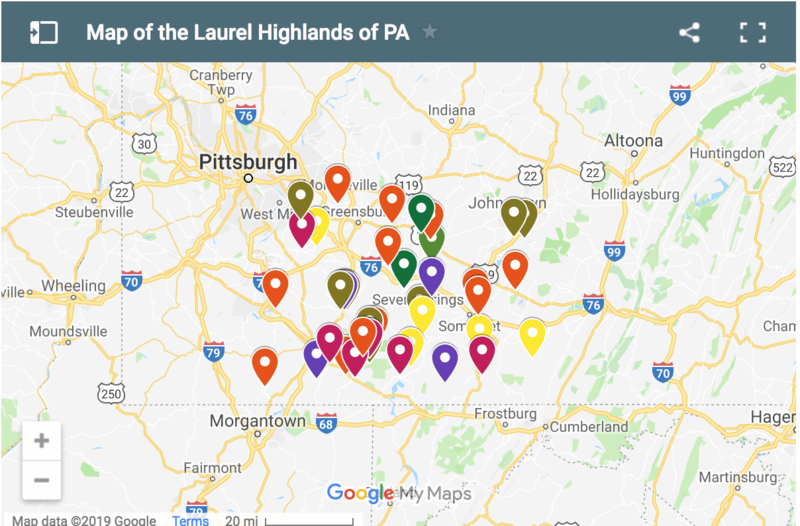 The Laurel Highlands in southwestern Pennsylvania is a popular destination for waterfall enthusiasts who flock to Ohiopyle State Park to visit their many great waterfalls. 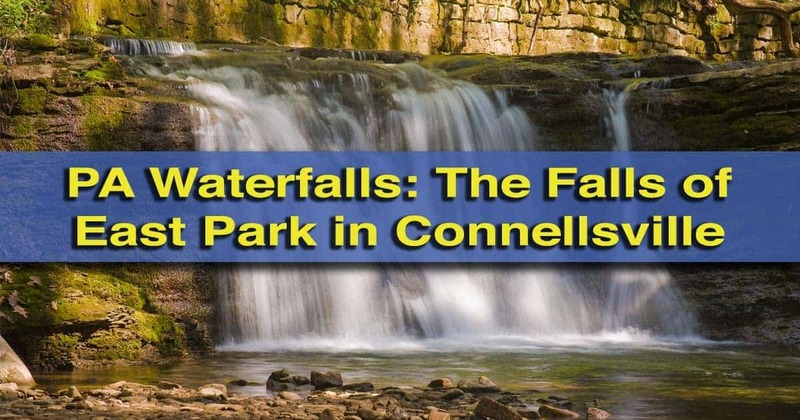 And, while a few make it over to nearby Connellsville to visit Robinson Falls, far fewer even know about the two waterfalls in East Park. 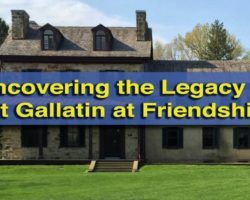 East Park sits in a residential area, just outside of downtown Connellsville on the eastern banks of the Youghiogheny River. This small park is located in a narrow gorge and features a playground, tennis court, and other recreation opportunities. However, for visitors, the highlight is a small portion of Connell Run that passes through the park. The twin waterfalls of East Park in Connellsville, as seen from the bridge crossing Connell Run. Along this stretch of Connell Run, which can be seen from the road into East Park, there are two small waterfalls, both roughly 7-8 feet tall. 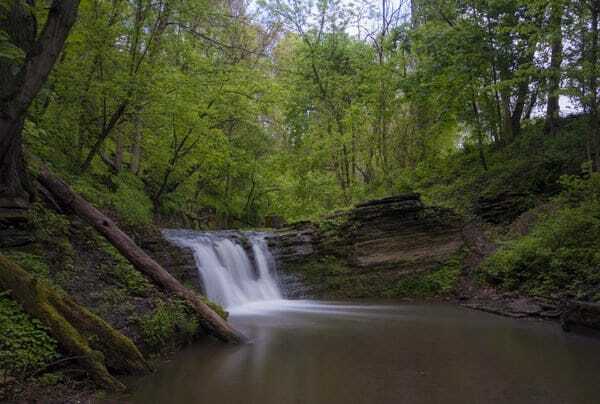 These small, but very beautiful waterfalls can not only been seen from the road, but are along a level walking path that goes 100 yards from the parking area to the second waterfall. These two waterfalls are located close together, with only about 50 feet separating the bottom of the upper falls from the top of the second. 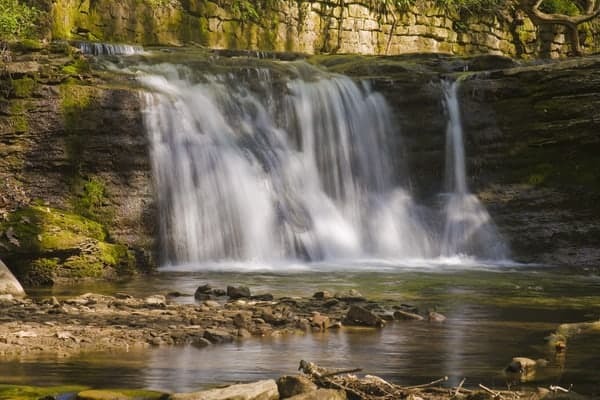 Upper East Park Falls can be seen with just a short, flat walk from your car. Having these two drops so close to each other, and having them both located so close to a parking area, makes the waterfalls of Connellsville’s East Park a quick and easy stop. 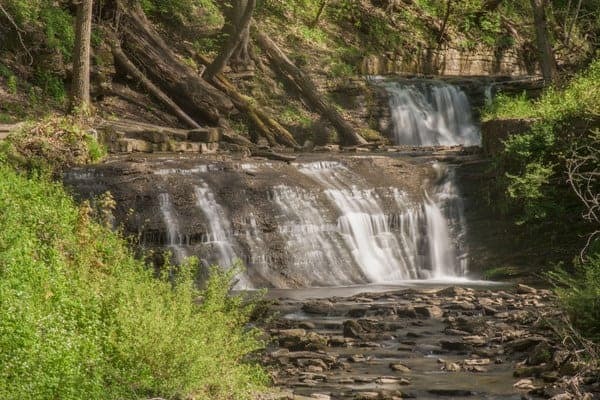 For those looking for easy-to-reach waterfalls, these two falls are located along a flat and well-maintained path, but can also be seen from the roadway, just a few yards from the parking area. 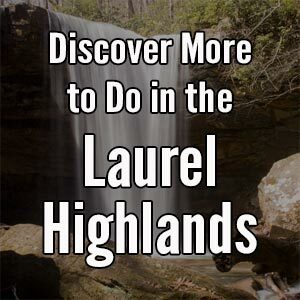 Since these waterfalls aren’t very tall and are located close to the trail, getting to the bottom of them is easy for those looking for a closer look or to get photographs. 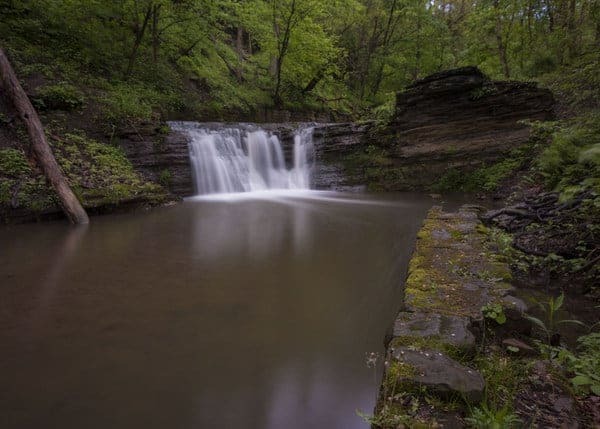 However, even when the waterfalls are flowing nicely, there isn’t enough water to make these waterfalls a place for swimmers, meaning you’ll likely be able to enjoy them without much distraction. Lower East Park Falls is probably twice as wide as it is tall. 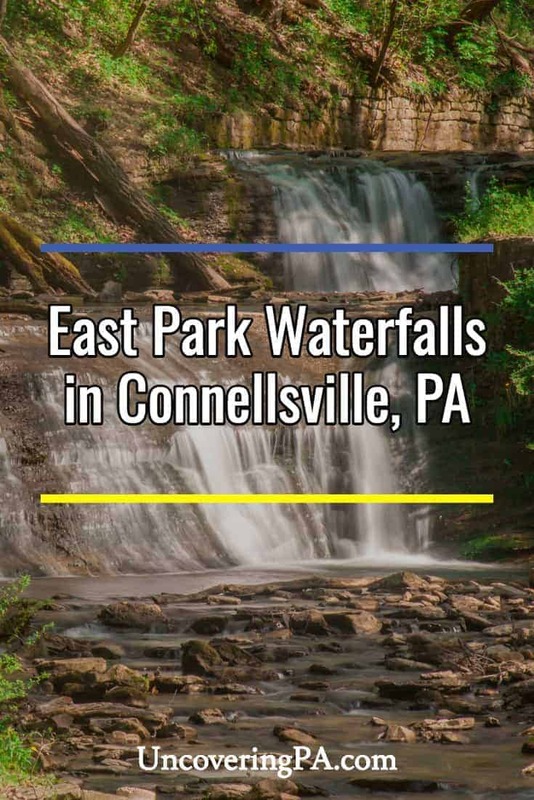 Overall, the two East Park waterfalls are an easy and fun destination for those visiting or passing through Connellsville, Pennsylvania.They are beautiful enough for photographers, but easy enough to reach that anyone can enjoy them. Upper East Park Falls was my favorite of the two. 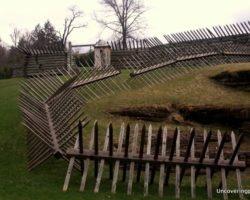 East Park is located in a residential area just east of downtown Connellsville in Fayette County, Pennsylvania. Parking for the waterfalls is in a small parking lot adjacent to the bathrooms, and can be found at the following coordinates: 40.017362, -79.583046. 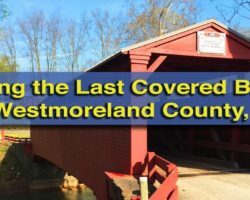 Once you’ve parked, head upstream, away from the bathrooms, playground, and tennis court, and cross the small bridge over Connell Run. If you haven’t seen the waterfalls already, you’ll be able to see them from this bridge. On the far side of Connell Run from the parking area, there is a wide, flat, and obvious path along the banks of the creek up to the waterfalls. A look at Upper East Park Falls from the far side of Connell Run. It should be noted that both time I visited, access from the northern side of the park was closed. 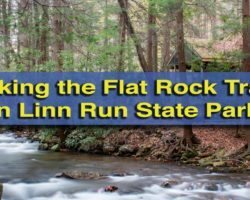 While your GPS may take you into the park from East South Street, you likely can only access the parking area from Run Avenue on the south side of Connell Run. 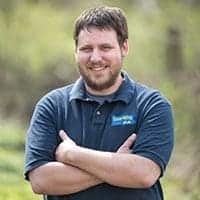 Great write up on these falls. I’ll have to check these out the next time I’m down that way. 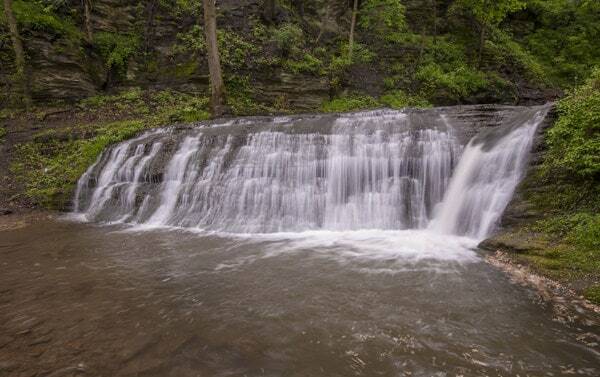 We visited the East Park Falls today, after reading about them in your column. They were very nice falls and easy to get to. Thank you! That’s great to hear! I’m really glad you had a nice visit. thank you for posting this! Great view of the falls today! Would have known they were there! THANKS!